Some athletes who can jump very high don’t necessarily look the part. NBA star DeAndre Jordan, for example, stands 6-foot-11 and weighs 265 pounds and yet he can lift that massive body off the ground high enough to make himself a regular on nightly highlight reels with his dunks. Or there’s NFL star J.J. Watt, a 6-5 defensive lineman who weighs 290 pounds and routinely disrupts opposing quarterbacks by elevating and swatting their passes down. Mutaz Essa Barshim, however, is an athlete who looks like he can jump. And he jumps higher than just about everyone else on the planet. The 24-year-old Barshim, a practicing Muslim from Qatar, is an elite high jumper on the international track and field circuit. Standing 6-2 and weighing just 143 pounds, he is long and lanky and light. He looks like he was built to sky high, soar far and stay in the air for a long time. Barshim’s fourth-place finished in the men’s high jump competition at this past summer’s IAAF World Championships in Beijing, China, was considered a huge upset. Not only did Barshim go into the meet as a gold medal favorite, many also predicted he might break the world record in Beijing. Barshim’s best jump at the World Championships measured 2.33 meters, the same height as China’s Guowei Zhang and Ukraine’s Bohdan Bondarenko. But those two had fewer misses during the competition and therefore tied for second place ahead of Barshim and behind Canada’s Derek Drouin, who won the gold with a 2.34-meter jump. Zhang and Bondarenko were both given silver medals, while Barshim left Beijing without a medal. It was a disappointing end to a disappointing season by Barshim’s standards. 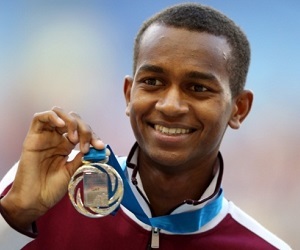 Before the worlds, Barshim won the bronze medal at the 2015 Asian Championships, snapping a streak of three major meets in which he’d claimed gold. And while Barshim set a personal best by clearing 2.43 meters in 2014, this past season he did not improve on that or get any closer to the world record of 2.45 meters set by Cuba’s Javier Sotomayor in 1993. Barshim now turns his attention to 2016, and specifically to the Rio Olympics next summer. He won bronze at the 2012 Olympics in London despite competing with a stress fracture in his back. Next year’s calendar also includes the World Indoor Championships that will be held in Portland, Oregon. Below is a video produced by Red Bull, one of Barshim’s sponsors, that provides a glimpse into Barshim’s life off the track and his training on the track.